I never think of myself as especially tech savvy. However, as I embark on my 40’s I find myself more anxious than ever to keep up with advances in technology. I have no time for endless research, so have happily sold my soul to Apple – the iPad, the iPhone and now a gorgeous, sleek, new Mac Book Pro. Whilst I enjoy a love affair with my new gadgets Him Indoors is less than impressed, as for all they offer in terms of wizardry they take back in constant begging for my attention. A new equilibrium needs to be reached between genuine interaction and social networking. I don’t have the balance right yet, but I’m working on it. A similar tension arises at work, which tends towards the all-consuming, so it’s a welcome distraction when the RHS hold one of their London shows, right around the corner from my office. 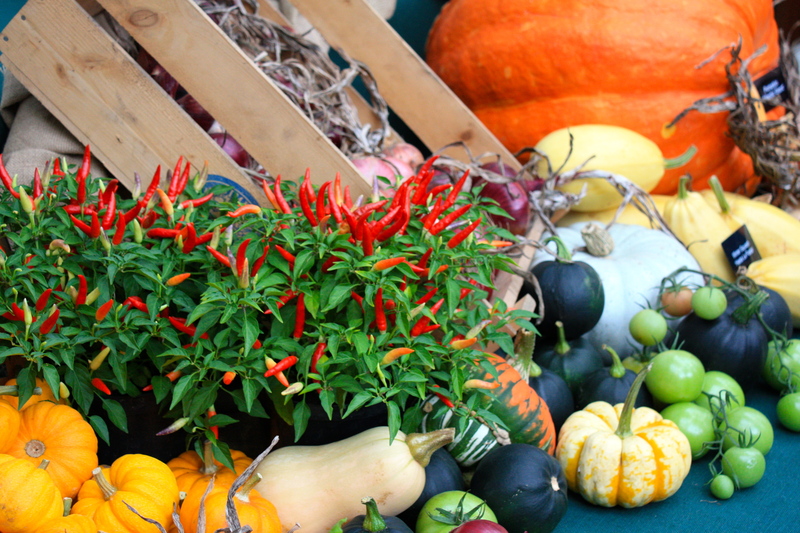 There has been a fruit and vegetable show in the RHS’s Lindley Hall almost every October since 1900. Originally a stage for the aristocrats of Britain to showcase the produce from their country estates, the show is now dominated by the hoi polloi, with only the Dukes of Marlborough and Devonshire still engaging in this most genteel of competitions. 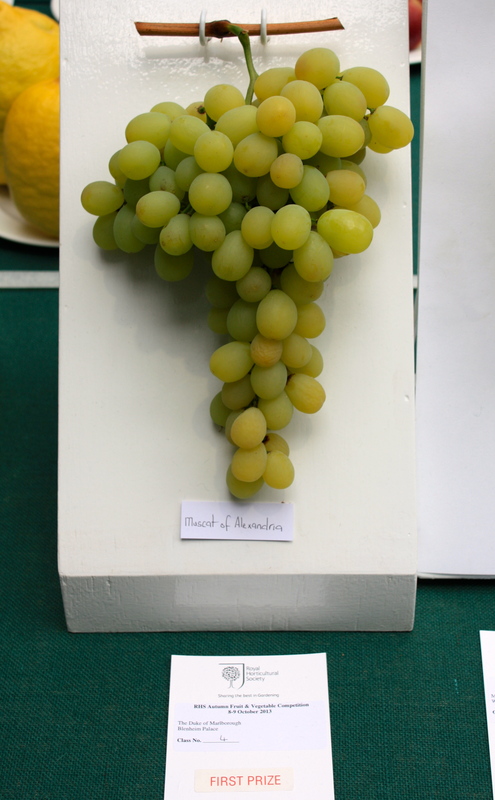 In this year’s contest the 11th Duke of Marlborough came out on top with three first prizes and one second in the grape classes. His magnificent bunch of white ‘Muscat of Alexandria’ grapes is pictured above. 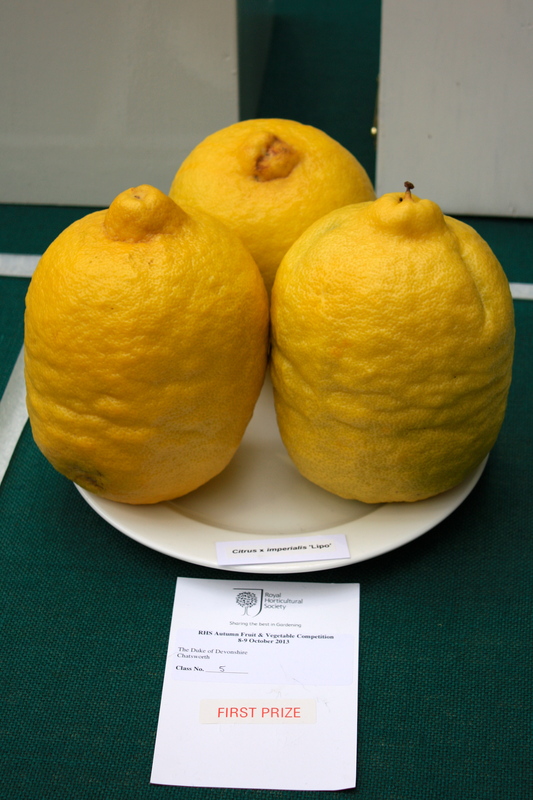 The Duke of Devonshire, the custodian of Chatsworth, managed only three seconds and a third, but regained his honour with a first prize for three Citrus x imperialis ‘Lipo’ for the second year running. Although the show no longer enjoys its original aristocratic endorsement, it has evolved to meet the requirements of the 21st Century. 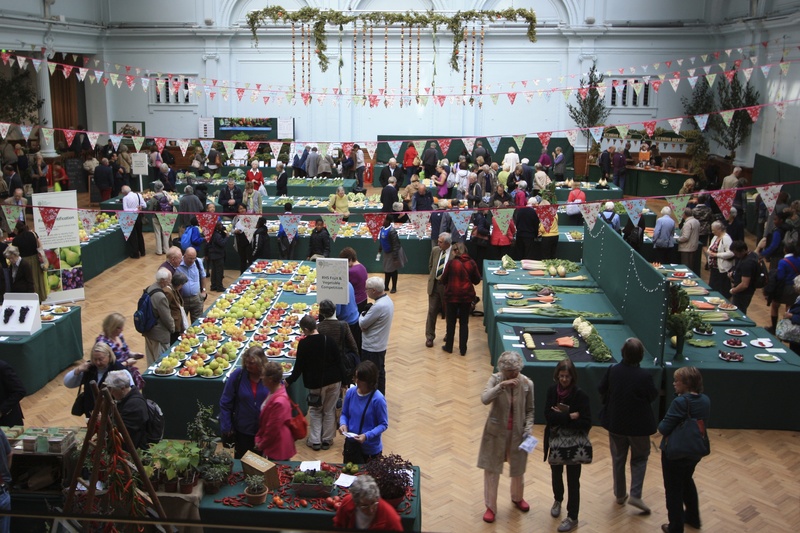 The Lindley Hall remains the perfect venue for displaying fruit and vegetables, its arched glass roof allowing just the right amount of light onto the baize-covered tables. 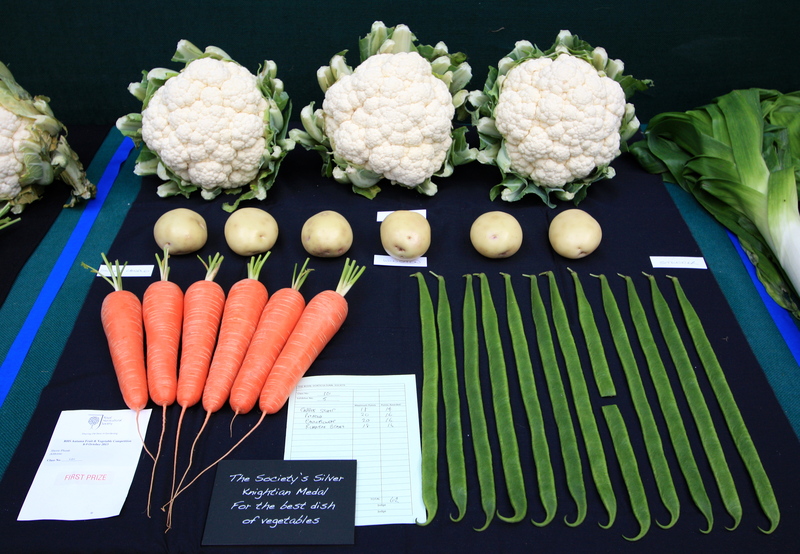 Each exhibit is judged by experts using the rules set out in The Horticultural Show Handbook. The book outlines exactly what the judges are looking for in each class. Apparently size isn’t everything, except when it comes to cooking onions, apples and, naturally, pumpkins. 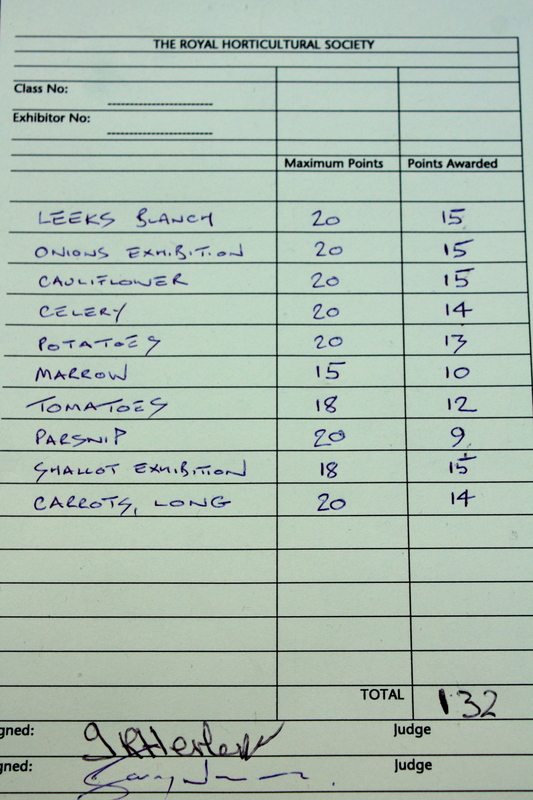 Below, the splendid first prize winning exhibit of ten vegetables entered by the North East Derbyshire branch of the National Vegetable Society, complete with score card. For complete novices like me, there are helpful tips on what to look for, neatly scribed onto smart grey tablets. 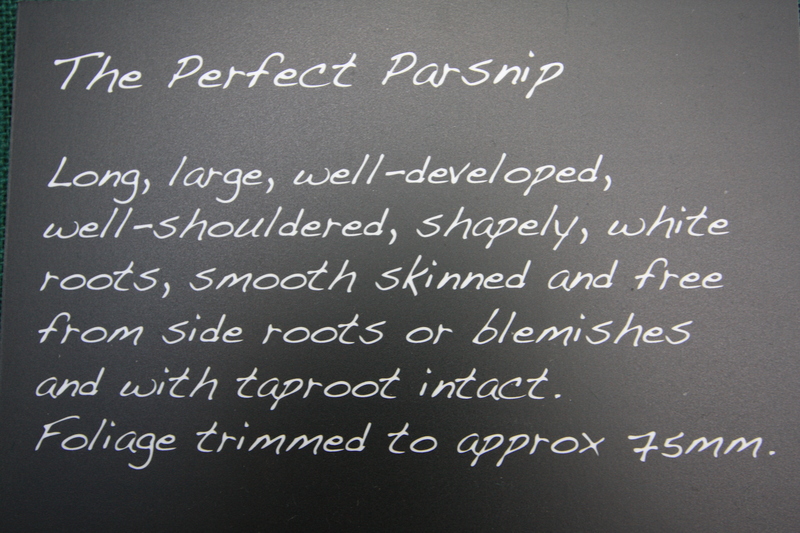 The description of the perfect parsnip could also apply to The Frustrated Gardener’s finely cultivated form, up to the point where roots come into the equation! Someone who clearly knows the rules is Sherie Plumb of Althorne, who won the Silver Knightian Medal for the best dish of vegetables, scoring 62 out of a possible 76. All four vegetables were immaculate, but the carrots and runner beans especially so. 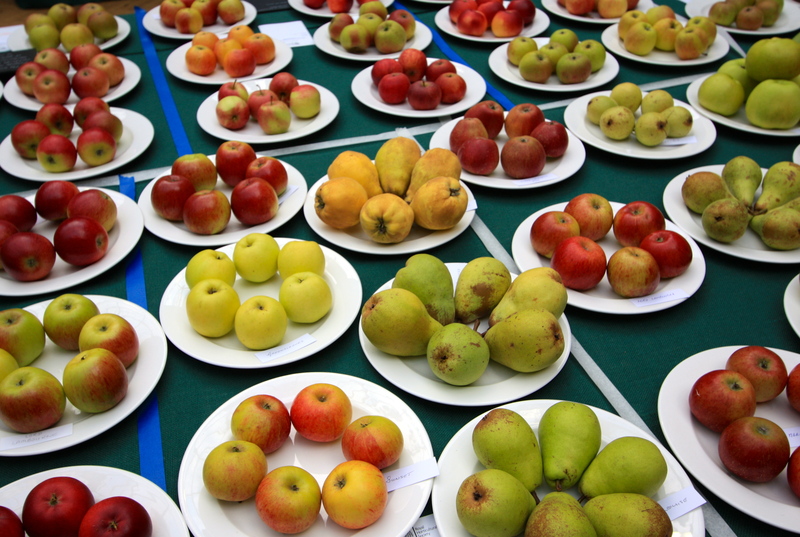 The most popular classes at this show are for apples (with a small a) and pears, which are customarily shown in sixes displayed on smart white plates. The range of varieties is extraordinary, with special categories set aside for rare and unusual types, the trestles bowing under the weight of the fragrant fruit. The RHS fruit department had a huge range of fruit available for tasting and to buy, from crisp russet apples to sweet creamy pears. However, my heart was captured by the classes that required an added element of artistry- the trugs and baskets of fruit and vegetables. 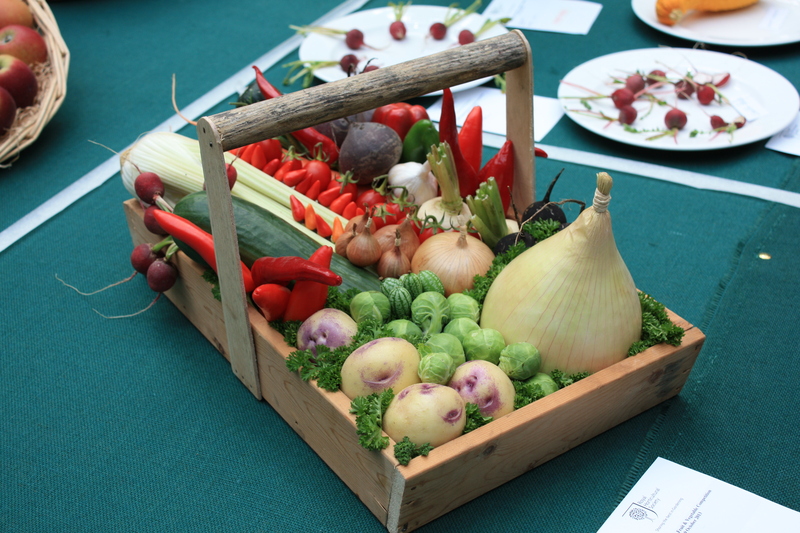 The winning basket of fruit is pictured at the top of this post and the winning vegetable trug below. Too good to eat….almost! Just an hour out of the office, away from any form of technology, had the desired restorative effect. My karma rebalanced, it was back to the grindstone, but with a new spring in my step and a greater respect for a different kind of apple. I am in awe! Exquisite – ohhh to be able to grow carrots that look like that. Oh come on Helen, I bet you’ll get some pretty good results yourself? And it’s all in the eating anyway. No point growing perfect fruit unless it tastes fabulous too. I am getting HK warmed up for you! I LOVE mine. It makes my photos look so much better …. to me anyway! 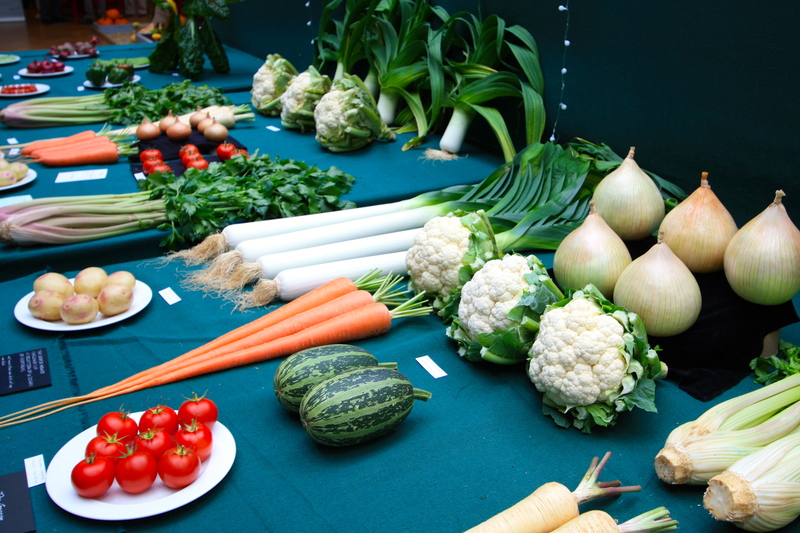 I guess these fruit and veg are the creme-de-la-creme, although we still have a lot of local horticultural shows too. Back in the day I used to enter our village show, but with nothing as impressive as these exhibits. Takes a lot of time and dedication to achieve this level of perfection. I am glad you posted photos! That was an AWESOME POST!